Just like my in-depth article on vitamin D, this piece on B12 is not short 'n sweet, and this is for two reasons: 1) There's a lot of misinformation about B12, and clearing up misconceptions about health issues is one of the things I do, and 2) It's vitally important that you have correct information about the things that can have a huge impact on your health, your quality of life, and your longevity, and B12 is one of those things. So this is not a B12 article that simply consists of information gathered from existing sources that my personal biases resonate with, like so many of the B12 articles out there (a good researcher should have no biases when seeking the truth/reality). While the purpose of this article is not so much to explain why there is so much contradictory B12 information, and instead it seeks to educate you about the facts surrounding B12 (which is what can really impact your health), if you read between the lines, and understand that people are subject to human nature which can include taking positions that support their personal philosophies, personal preferences, and personal beliefs, you may find some clues as to why some people can write a B12 article that contains both 100% spot-on information and some incorrect information too. Some vegan health educators and laypeople (especially raw food vegans) claim that vegans do not have to worry about B12, or that supplementation is not the answer. Research, and my clinical experience, clearly show that plant-based foods are not a sufficient and reliable source of B12, and that most vegans, even raw food vegans, become deficient at some point if they do not supplement in some form. But why is this? We obviously weren't designed to require nutritional supplements. Where is B12 supposed to come from? This article will attempt to answer this hotly debated question. Is there, or is there not, any B12 in food? Turns out, there is B12 in any food that contains quantities of the B vitamin complex, but previously we were just not able to assay these tiny amounts. 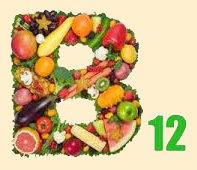 Today, more modern technology has allowed us to discover that there is B12 in those foods rich in the B complex vitamins. But, it is not enough to rely on for our B12 needs! And that's the take-home point. So just because there is some B12 in some plant-based foods is not proof that this is where we're designed to get our B12 from. So when someone tells you that there's B12 in fruits, don't argue the point, simply ask them, "but is it enough to supply us with what we need?" Because that's what matters! And maybe millions of years ago, when stress levels were lower than they are today, and therefore our B12 needs were lower, and we also got some naturally occurring B12 from the water we drank, and we were active enough ("appropriately active") to eat enough food to get enough protein to make enough Intrinsic Factor (needed to utilize the B12 we make), then, yes, maybe this amount of B12 was enough  along with what our bodies made  to provide us with all the B12 we needed. But that was millions of years ago. Let's deal with the point in time where we're living now. Let's deal with reality. And in reality, there are many reasons why meat-eaters, vegetarians, vegans, and raw foodists should test their B12 levels and correct insufficiencies/deficiencies, especially since long-term deficiencies can cause vascular injury and irreversible neurological damage. And by-the-way, the little bit of soil that may contain B12 that may be on the fruits and veggies you're eating (by not washing them), is not a source of B12 for us. 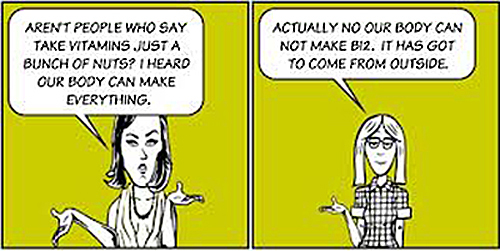 Okay, first, what is B12? So where are we supposed to get our B12 from? The good news is: We can make it ourselves! But among the many controversies surrounding B12, there is the argument that, although Intrinsic Factor (needed to absorb B12) is produced in our stomachs, and that our intestines are known to produce B12, the B12 is produced too low down in the intestines to be absorbed by our bodies. But this argument was disproved by research decades ago and is nothing more than a theory, and a disproven one at that. Indeed, in a 1999 version of Human Anatomy and Physiology, it states quite clearly that we do indeed absorb B12 through our small intestines. So this is how we're supposed to be able to get B12. I say "supposed to" because there are some things we do that prevent this from happening. Some vegans and vegetarians use things like garlic and onions when making recipes, or consume them when eating prepared foods, and some raw foodists continue to use them in recipes because they are, after all, raw. But looking at things, like garlic, in isolation  considering just its benefits without considering the detrimental aspects  is an unbalanced way of looking at something. These substances impair/damage our intestinal flora, and although once their consumption is stopped, the body can eventually repair/rebalance things, B12 production can be affected for a long enough period of time to allow a low B12 level to exist long enough to be harmful. And it's been known for quite some time that it's not a good idea to take an antibiotic when you don't need to, and things like garlic have antibiotic properties. So on balance, the benefits from these irritating substances are far outweighed by their detrimental aspects. My philosophy is to get their benefits from things that don't contain their downsides, and that's easy to do (once you start thinking even further outside the box). 4. The protein component: (This one applies to those eating an all-raw, low-fat diet, so it doesn't get much press for obvious reasons.) B12 requires several binding proteins in order to be absorbed properly. The stomach secretes a protein  called the Intrinsic Factor  which binds with B12 and then adheres to specialized receptors in the small intestine where it is brought inside of the cells that line the intestinal wall. B12 is then transferred to another protein, Transcobalamin II, which circulates through the bloodstream to all parts of the body. If someone is following an all-raw, fruit-based diet, where their protein content is very close to the bare minimum (as far as the carbs-to-fat-to-protein ratio is concerned), and they are also less active than they should be, they may not be eating enough food to provide enough of all the Essential Amino Acids (EAAs) which are the building blocks of proteins, and as a result, a protein required to utilize B12 may be insufficient enough to result in a B12 insufficiency. So if your carbs-to-fat-to-protein ratio is averaging out to be close to 90-5-5 (as percentages of total calories), be active enough to be able to eat enough food to provide enough EAAs (and also EFAs). By a show of hands, how many of you were aware of this issue?... See, not very well-known. Aren't you glad you found this article? "Some bacteria in the small intestine do produce vitamin B12. The amount of vitamin B12 which is produced does not appear adequate to prevent vitamin B12 deficiency."  Reed Mangels, Ph.D., R.D. Although a broad-brush statement, this is what he has observed in general, and the probable reasons for this will be discussed below. I use this phrase a lot. And although some would simply say it's just a matter of degree, it's describing two different scenarios, each with their own set of issues and remedies. "Insufficiency" can be described as not enough of a nutrient for optimal health, but not so low that serious damage is being done, but this will likely happen if the insufficiency gets worse (turns into a deficiency), or if it becomes a long-standing insufficiency. Insufficiencies may be "sub-clinical" in that it is currently impossible to detect them with our present level of testing technology even though, from the body's perspective, there isn't enough of the nutrient to efficiently and effectively carry out the body's day-to-day maintenance and repair work, and there isn't enough to give you the best odds of never getting a diagnosis of something serious in the future. Insufficiencies may cause symptoms, but they are usually not noticed or not recognized as a symptom of anything being wrong, but people who are in really good health otherwise, and are more in tune with their body than the general public, may perceive that something is "off" even though they can't put into words what they're feeling (this was my case when I developed a B12 insufficiency). A "deficiency" is an insufficiency that has gotten worse to the point where damage is being done. Here there are usually noticeable symptoms, but even these symptoms can be chalked up to "getting older" by some people. And this is why I am trying to raise awareness of this issue, so these folks can prevent B12 from getting too low; unlike other nutrient deficiencies, damage from a long-standing B12 deficiency can be irreversible. The other notable difference between insufficiencies and deficiencies is the amount of supplemental nutrient needed to correct the problem. There is a difference between a "maintenance dose" of a nutrient which is meant to compensate for the nutritionally sub-par food we get from an agri-based food supply system (for those nutrients that are supposed to come from food), and a "therapeutic dose" which is taken short term and meant to correct an insufficiency/deficiency, in-other-words, meant to normalize your sufficiency level. You went raw not just to improve your health, but to get the best health possible by eating the best diet possible (and by paying attention to all the other equally important requirements of robust health besides diet). But "diet" isn't just the foods we're designed to eat, it's also the nutrients we're designed to require. So if the foods you're eating are coming from an agri-based food supply system, they can't be as nutrient-dense as they could be and should be. "Diet" should be looked at in terms of the foods and nutrients we're designed to need, and both categories are equally important. You could be eating all the foods you're best suited to eat, but maybe you're not eating enough of them to get all the EAAs and EFAs you need because you're eating a too-low fat diet. (Or you're eating too much of these foods, getting more calories than you require.) And even if you're eating the right foods and just the right amount of these foods, calorie-wise, what if they are nutritionally lacking because of the way they're grown? There can be a big difference  nutritionally  between foods that grow for us, and foods that are grown for us. I'm fond of saying "food matters... nutrition matters too" because of the unbalanced focus we place on food with not enough attention being paid to our nutrient needs. And those folks who are still teaching, what is actually an optimistic theory  that we can get all the nutrients we need as long as we don't cook what we eat  are doing the vastly expanding raw food community a disservice in my opinion. My latest raw food book contains some very important information that all raw foodists should be aware of. "The deficiency rates reported for specific populations were as follows: 62% among pregnant women, 25-86% among children, 21-41% among adolescents, and 11-90% among the elderly. Higher rates of deficiency were reported among vegans compared with vegetarians and among individuals who had adhered to a vegetarian diet since birth compared with those who had adopted such a diet later in life. The main finding of this review is that vegetarians develop B12 deficiency regardless of demographic characteristics, place of residency, age, or type of vegetarian diet. Vegetarians [and vegans and actually, everyone] should thus take preventive measures to ensure adequate intake of this vitamin [like at the very least, testing]." Another group of people who are at risk of B12 deficiency are breastfed infants of mothers whose own intake/production of B12 is low. If a mother is already B12 deficient during pregnancy, the baby may be born with seriously low B12 levels and develop clinical signs of deficiency in as soon as two weeks, or can simply start out life with a sub-clinically low B12 level if the mother was B12 insufficient. A study in the U.K. showed that there was normal growth and development in vegan children who were breastfed for six months at a minimum when their moms were taking B12 supplementation. I mention this because there are adults who are against using supplements, and that's a personal decision. But mothers-to-be presumably want the best for their child, and naturally their child deserves a healthy start in life. So it may be prudent to apply the philosophy of "better to be safe than sorry" to the issue of supplementation when making a baby. And this involves making sure you are B12 sufficient (and EFAs, D, and iodine/iodide sufficient to name a few of the more potentially problematic nutrients for those eating our modern, agri-based supplied foods, and living far north/south of the equator... iodine especially, if you want the smartest child you can make). Being that I just mentioned it, it comes to mind that low B12 levels (a high uMMA) can have as a contributing factor, low iodine levels. Anyone with a low B12 status (I'm not talking about your B12 blood level here) should get an iodine test done. But even if you have an "okay" B12 status, this does not automatically mean that your iodine level is also okay; in reality, based on all the people I've tested for iodine, everyone should get their iodine level checked (fully 100% of the folks I've tested thus far have had low iodine levels to some degree, which is not surprising when you understand how this can be so). Now here's the kicker: MDs will do a spot iodine urine test to check your iodine, but this is not indicative of the body's iodine tissue sufficiency level, which is a much better indicator of your iodine status (just as an MMA test is better than a B12 blood test). So a 24-hour iodine loading test is best for diagnostic purposes, but it should come as no surprise that the most diagnostically relevant tests are not covered by insurance, and are not available everywhere. In fact, only two labs in the U.S. do the 24-hour iodine loading test, and I'm one of a small number of practitioners who recommends it, and knows how to assess the results as it relates to corrective measures. And iodine may actually be more problematic than B12 because our body can't make it; and the RDI for iodine is too low for iodine sufficiency (more on the shortcomings of the RDIs below). But iodine is a story for another article; I digressed only because of the prevalence of iodine insufficiency/deficiency and its importance to optimal health. And exactly how does iodine play a role in B12 utilization? Iodine insufficiency = underactive thyroid = less T4 than normal, and T4 is needed not just to make T3, but is an integral part of converting riboflavin (vitamin B2) to its active coenzyme form "FAD" which is needed for proper methylation ("methyl" as in the active form of B12, methylcobalamin). This will not be on the test. In the U.S., a B12 blood test is standard-of-care for testing B12. The range is 211 - 946 pg/mL, meaning 211 is the low end of the "okay" range. But the low end is now thought to be too low; in Japan, where their cases of dementia are much less than in the U.S., their low end is 500. But, even if you test at 500, you may still be too low, utilization-wise; here's why. If all you can get is a sMMA test (blood test, the "s" is for serum), the range there is 0-376 nmol/L (0.00-0.38 µmol/l), with the lower, the better. For obvious reasons, the MMA test is considered the Gold Standard for B12 level testing, but there is another test that can also reveal a B12 deficiency: a homocysteine blood test (sHCY). If it's elevated, you may have a B12 deficiency (but just because homocysteine is normal doesn't mean you don't have a B12 deficiency, which is why the MMA test should be done). Elevated homocysteine (hyperhomocysteinemia) also happens with deficiencies in B6 or folate*, which may affect people who eat a horrible diet, and some vegetarians and vegans. And elevated homocysteine can also occur when an animal-based diet is eaten, especially meat because it contains a higher amount (than a plant-based diet) of an amino acid called methionine which can have the effect of raising homocysteine into the unhealthy range. * Folic acid is the synthetic form of folate and is to be avoided. So if non-vegans want to test their B12, the MMA test is the way to go. But since they are eating foods humans are not designed to eat, getting a homocysteine test too can let them know if they need to cut back on their animal eating so they don't risk heart disease and deterioration of their arteries and nerves (when homocysteine is high, it acts as a nerve and blood vessel toxin and can accelerate atherosclerosis, the primary cause of heart attacks and strokes). So a sHCY test is another good tool in your toolbox because high homocysteine levels are connected with the potential for heart disease, arterial destruction and neurological pathologies. Other diseases associated with an elevated homocysteine are: Alzheimer's and age related hearing loss (due to low B12), neural tube defects (due to low folate), recurrent loss of pregnancy, and, you guessed it, premature death. "Mean homocysteine concentration more than 10 umol/L among vegetarians was reported in 32 of 34 reports."  From Is Vitamin B12 Deficiency a Risk Factor for Cardiovascular Disease in Vegetarians by Roman Pawlak, Ph.D., R.D. A note on assessing your need for supplementary B12 by simply taking some for a while and seeing how you feel: This does not appear to be a good idea. I have found this to be too subjective a "test". A number of folks who tried this and concluded that they were fine, who then got tested (uMMA test) were in reality, not fine. A few had used oral (swallowed) B12, so the "no effect" was understandable for the reasons given below, but most had used a good quality sublingual. And when I was diagnosed with a rather low B12 deficiency, and then took therapeutic amounts of B12, and retested a week later, and was then okay, I didn't feel any better when I took the B12. So this method is not a reliable way to test your B12 status. When looking at a nutrient, we tend to look at two issues: how much of the nutrient is in a certain food, and how much of the nutrient do we require. We usually turn to charts or databases to look up both. The "requirement" info is often segmented into gender and age-range categories, but these charts are still just approximations, and often have little to do with real-world needs. For example, B12 requirements vary greatly depending on environmental factors like air pollution, and on stress levels. Where are the categories on the B12 requirement charts for mild, medium, and high stress, and low, medium, and high air pollution? Point being, we shouldn't rely on generalized charts. What we should rely on is individualized testing. And as for the RDIs for various nutrients, these charts are essentially useless. Many of the values are either politically motivated, or based on theoretical constructs (educated guesses), or are just enough to prevent the conditions associated with the most severe form of a deficiency, like rickets (D), scurvy (C), beriberi (B1), goiter (iodine), etc. Hey, it's great that the RDI will prevent us from getting those most severe conditions that once plagued our population, but how much do we need for optimal health, which is the other end of the spectrum? Answer: As it turns out, for many of the nutrients, a lot more than the RDI in my opinion (I must label this as my opinion so as not to incur anyone's wrath). 1. The methylcobalamin form of B12 is used by the enzyme methionine synthase to change homocysteine into methionine. When this enzyme is not working, our homocysteine level increases, and as I said earlier, this is associated with increased risk of heart disease and deterioration of the arteries and nerves (don't you just love my gentle reminders). 2. Another function of B12 is as a coenzyme in using 5-deoxyadenosylcobalamin in the enzyme methyl malonyl-CoA mutase in the conversion of methyl malonyl-coA to succinyl-CoA. I mention this complicated stuff as an example of what you don't need to know (and that I do my homework). But seriously, this function of B12 is why there's a direct correlation between a low B12 status and a high MMA level, and it's why the MMA test is the Gold Standard for B12 testing. For the sake of completeness, I should add that it's often said that there's only one reason MMA can be high, and that's due to a bad B12 status. But there are some other documented reasons attributed to high MMA such as genetic defects, kidney failure, low blood volume, dysbiosis (microbial imbalances in the GI tract), pregnancy, and hypothyroidism. But since some of these conditions can themselves have as a contributing factor a low B12 status, and since some of these conditions can cause a low B12 status (by requiring larger than normal amounts of B12), when your MMA test result is high, it's a good idea to figure that your B12 status is low, and to supplement to correct it, and then retest MMA in a month to see if it came down. I've heard it said that proactive (precautionary) testing is not necessary, and to wait for symptoms to manifest before testing. From my experience, this is not a wise thing to do. In fact, let me be blunt, this advice is irresponsible, and the only good thing about it is, it says something very telling about the person who gives such advice (calls into question the correctness of their teachings in general). As far as the recommendation itself, first, you may not realize you're having a problem until a B12 deficiency gets far enough along to where you experience symptoms; the damage from a B12 deficiency doesn't start at the onset of symptoms, it starts prior to them. And if and when you do notice something is going on, and you try to self-diagnose without testing, you may draw the wrong conclusions, and while you're proceeding down the wrong corrective path, the B12 deficiency is getting worse. And considering that damage may be done that doesn't affect you now, but will affect you in the future, the prudent thing to do would be to keep tabs on your B12 status. And you can also get a uMMA test done once, and supplement from then on if the deficiency was potentially problematic, semi-serious or serious (although follow-up testing is a wise thing to do to make sure you're taking enough and/or taking it often enough). There are a variety of symptoms of B12 deficiency. An early symptom can be low energy. But be careful when attempting to self-diagnose; if you read this, and realize you have low energy, you may assume you're low in B12, but there are other contributing factors to low energy, low iodine being one of the major ones (because of how it affects metabolism and hormones). So when self-diagnosing, it's prudent to get a second opinion (from someone who doesn't have a bias against nutritional supplementation). And if impaired memory and behavior changes are "pre-Alzheimer's", normalizing the B12 level ASAP may prevent full-blown Alzheimer's which is irreversible. Yes, some of the neurological symptoms can lead to irreversible damage if they go on too long; for example, deep myelination (the erosion of the protective sheath around the axons of neurons). And it's important to note that impaired mental function can occur before any of the other B12 symptoms. Many of the above symptoms can be due to things other than low B12 status, and if this is the case, testing your MMA may rule out low B12 as a cause, which is diagnostically significant. It's also important to note that high homocysteine levels have no symptoms, so you can be B12 deficient, increasing your risk of vascular damage because of elevated homocysteine without experiencing any noticeable symptoms, underscoring the importance of testing (the first symptom of long-standing, elevated homocysteine can be a fatal heart attack). If your uMMA shows you to be low in B12 (because it's high), corrective steps should be taken. B12 from pills: There are two types: oral (swallowed), and sublingual (under-the-tongue, sometimes called "chewable" but don't chew them). Sublingual is preferred because the B12 gets absorbed directly into the bloodstream (oral B12 is not a reliable source of supplemental B12 because it doesn't work for a lot of people). And then there are the two popular forms of B12: cyanocobalamin and methylcobalamin. Without going into a lot of unnecessary detail, the "methyl" form is the one to take. Methylcobalamin is the active form of B12, which means it works immediately in the body when absorbed, and is delivered efficiently to nerve tissues. Cyanocobalamin is the cheaper of the two. In the rare case when the methyl form doesn't normalize MMA, then try adenosylcobalamin (aka dibencozide). Yes, sublingual tablets will contain tableting agents and maybe a flavoring, and some people will bristle at the thought of putting such things in their body, but on balance, it's better to not have a B12 insufficiency/deficiency; a healthy body is more than capable of dealing with the tiny bit of "other ingredients" that it has no use for. B12 from injections: There are two basic reasons that warrant invasively piercing the skin with a needle to get B12 (it may seem like I have a bias against injections, but read on). In rare instances, a sublingual B12 won't work, and it is then that B12 injections are called for, but again this is rare, and a follow-up MMA test after you've supplemented for a month with tablets will confirm effectiveness (this is another reason why follow-up testing is a good idea). The other rationale for an injection is if you are at the doctor's office when (s)he goes over the test results, and you are found to be dangerously low... a "no time to waste" scenario. But if you have a choice between resolving a low B12 condition with either injections or sublingual tablets, the less damaging choice is advised (injections also contain preservatives which are worse than the "other ingredients" listed on the sublingual bottle in my opinion... hey look, one of the rare instances of me rendering an opinion!). Studies of people with severe B12 deficiencies have shown that sublingual doses of 1,000 micrograms per day for two months worked as well as 1,000 microgram injections given repeatedly, so if you're not experiencing any symptoms of B12 insufficiency/deficiency, correcting a low B12 status with a sublingual supplement may be preferable to injections. And remember, the body's alarm bells go off whenever the skin is pierced. And while speaking with a "progressive" medical doctor, he said that if you can avoid being medically cut or punctured, do so. I agree. B12 from transdermal patches: Not effective enough, usually does not lower MMA enough, a hit-or-miss thing regarding different brands, in short, not recommended for resolving a B12 deficiency. Why do so many non-traditional "health educators" recommend them? Well, because they sell them, and the profit margin is way higher than tablets (this is why I used quotation marks around "health educators"). Since I don't sell supplements or participate in affiliate programs, there is no conflict-of-interest regarding my supplement recommendations. B12 from drops: There are B12 drops, but from what I've been able to gather, the tablets are better absorbed. And my clinical experience regarding efficacy has been with the tablets (recommendations at the end of this article). I mention this because the supplement industry is not regulated in the same way as the pharmaceutical industry; when a bottle of Tylenol says it has 100 mg of acetaminophen per tablet, you can take that to the bank. But just because a bottle of B12 drops says it has 1,000 mcg of methylcobalamin per drop doesn't necessarily mean it has 1,000 mcg of methylcobalamin per drop. Sad, but true, and yet another reason to do follow-up testing. Depending on the depth of the B12 insufficiency based on a B12 test, you'd either take daily sublingual tablets of either a low or high dosage, or an injection. I'm hoping you can go with the tablets. A non-supplement way of raising your B12 level is to live in such a way that your B12 needs come down. This involves lowering both your emotional stress level and your physiological stress level by living in a more healthful manner, and by not consuming the things that interfere with B12 production in the body that I mentioned earlier (which allows increased B12 production). I've heard it recommended that if you find you do indeed have a B12 insufficiency/deficiency, that you do a therapeutic water-only fast, and that this will correct the absorption problem. Sometimes this works, and sometimes it doesn't. Firstly, if the absorption problem was due to a genetic defect concerning the production of Intrinsic Factor, a fast will not resolve this. Secondly, if the low B12 issue was caused by the inclusion of the things that interfere with B12 being made in the body, a fast will not resolve this either, as the person will sometimes continue his "normal" dietary habits after he recovers from the fast. So B12 levels may come up just after a fast, but this can be temporary. And it goes without saying that if the low B12 level is because of a low cobalt level, a fast will obviously make matters worse. And even if a fast, followed by healthful living habits, can eventually correct a B12 absorption issue, if the low B12 reading was low enough, it's prudent to correct the level pre-fast, or post-fast at the latest (remember, in Nature, such a low B12 level would never have happened, so this very low B12 level is, in effect, an unnatural situation, and using one unnatural situation  supplementation  to deal with another unnatural situation is a kind of balance in itself, yes?). So since, in some cases, fasting is not an alternative to resolving low B12 levels with supplementation, it may be a good idea to correct the insufficiency/deficiency with supplementation whether you fast or not... this is a case of "better to be safe than sorry". And since I'm discussing fasting, the notion that's promoted by some health educators who run fasting retreats/clinics that most people are consuming all the nutrients they need, they're simply not able to absorb them, and that fasting is the single most powerful thing people can do to correct nutritional deficiencies, is not a realistic statement. Is this a case of if the tool you use is a hammer, all problems resemble a nail? Maybe. Now, I'm not saying that fasting can't provide some health benefits, it clearly can, and I'm an advocate of body-initiated fasting and nutritionally supported extended fasting. But in my experience, fasting should not be the "first step" in dealing with a nutritional deficiency. Obviously, some people who run fasting centers or retreats disagree. But this is not a subjective issue. Everyone is entitled to their own opinions, but everyone is not entitled to their own facts. Additionally, I don't recommend nutritional yeast as a way to raise B12 status because the only way nutritional yeast contains B12 is if it's been fortified with it... nutritional yeast does not contain any naturally occurring B12. So now you have the issue of which form of B12 was added and how much of it is bioavailable. So the safest and healthiest approach is a combination of healthful living habits and B12 supplementation if necessary or as a hedge against a future deficiency. 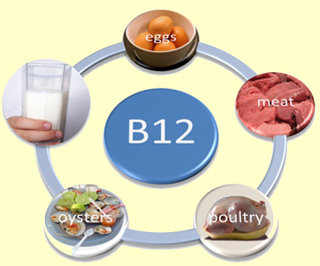 When B12 was discovered, and when a lack of it was linked to "pernicious" anemia (macrocytic anemia), it was mandated by the U.S. government that B12 be added to the populations' food supply. So B12 was then sprayed onto cereal as it was dispensed into its box at the packaging plant, and it was added to many other foodstuffs as well. This ended the high rate of pernicious anemia. But the amount used was just enough to prevent the worst-case scenario; it wasn't enough to prevent the chronic degenerative conditions that are now being directly linked to long standing B12 insufficiencies  conditions that affect cognitive functioning and other neurological issues for example. (See "A word about published B12 requirements and Recommended Daily Intakes" above). Obviously, both these folks got a hold of some incorrect information. "There are many different ways that deficiencies could arise. First, a person could have inadequate intake of vitamin B12. This is extremely rare, since it is found in most animal proteins." As you can see from the picture on the right, this is a popular notion. What is not being considered in this statement is that B12 is highly heat labile, so it is damaged/inactivated by the heat of cooking. So cooked animal products are not a source of active B12. It should be noted that B12 deficiencies do occur in non-vegetarian populations, so even meat-eaters get B12 insufficiencies/deficiencies. This can be because some meat-eaters don't eat a lot of processed foods which are fortified with B12, and/or they do consume a lot of the things that interfere with the body's ability to make B12 (listed above). Before you develop the anemia associated with low B12, and the enlargement of red blood cells (macrocytic anemia), a B12 deficiency can cause mental and neurological effects. That was described in 1905 by J.W. Langdon in the Journal of the American Medical Association. 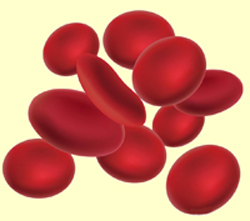 Yet to this day, many physicians in the U.S. think that to have a B12 deficiency you have to be anemic, and you have to have enlarged red blood cells. This is why it is a wonderful thing that we can test our own B12 status ourselves with a very objective test (but passing your results by a knowledgeable health educator is a good idea). "People on diets low in B12, including vegans and some vegetarians, may be obtaining more B12 from reabsorption than from dietary sources. Reabsorption is the reason it can take over 20 years for a deficiency disease to develop." This implies that B12 can or is supposed to come from the foods we eat. It isn't. This statement can also suggest that it can take a long time for a B12 deficiency to develop, and although it can, it can also develop in three years, so in reality, anyone is subject to a B12 deficiency. And as I've said, a deficiency isn't the only thing you should be trying to avoid; a B12 insufficiency is also a bad thing and should be avoided as well (just as with any other nutrient). "People who eat a raw food diet don't need to be concerned about nutrition." There are raw food health educators who have this popular notion as their official position, and some apply it to B12 as well. But because this has been shown to be incorrect, it would be unwise to enbrace this admittedly lovely notion if you want the best health your DNA can provide. And by-the-way, this applies not just to B12. Because of the way the agri-based food industry grows the fruits and greens many people are buying, an otherwise correct diet will not be able to supply enough of all the food-provided nutrients the body needs for optimal health. Here are the reasons why. And here are the reasons we actually need more than enough to get enough. Some people are reluctant to take a supplement as they see this as admitting the inferiority of their diet, or because they've been taught that they don't need to take supplements as long as they don't cook what they eat (which is incorrect). But since it's a safe bet that the majority of the vegan and raw food community will, over time, run the risk of a B12 insufficiency/deficiency and an increased homocysteine level if there's no supplementation with a reliable B12 source, the solution to possible B12 problems is to get your MMA levels checked regularly. If your levels continue to be fine without any form of supplementation, that's great, but that is rarely the case for one reason or another. If your levels become low, then supplementation of some form should be considered if robust health is a priority. And to those who say to simply just supplement in the first place, no testing needed, here's my problem with that. If a person absolutely can't afford to get a uMMA test (about $149), then, yes, this advice comes under the heading of "better to be safe than sorry". But what if the amount of B12 you decide to take is not enough? Without testing, you won't know. And because you're taking some B12, you may not get to the point of a full-blown dangerous B12 deficiency, but you could bump up against a B12 insufficiency where your body doesn't have enough B12 to operate at its full potential, which could translate to not having the best odds of avoiding a diagnosis of something serious in your future. A B12 level isn't an "okay / not-okay" scenario. Along with two other "problematic" nutrients, B12 is one of the things I test my clients for, and it's a mandatory test in my practice. You can use this B12 DIY "guide" you've been reading along with other B12 info to self-assess and self-correct, and if you wish to utilize my services for a more comprehensive check of the other problematic nutrients, and for going over your B12 situation, along with some insightful counseling, see Health101.org/counseling (articles I've written in the past have not included this paragraph, but today there is simply way too much misinformation that is causing people to travel down a path that will ultimately not allow them to be successful with their health restoration and maintenance goals, and only allow them to survive and not thrive, thus my motivation for mentioning my counseling practice). Q: Have you found people with good B12 levels without supplementation who are eating the healthiest version of a raw vegan diet and supplementing with a good green powder? A: Only one so far. And it was surprising (because of how many people I've counseled who had a poor B12 status who were eating a great diet... but remember, B12 is not intended to be supplied by the diet). This person was doing everything perfectly, consuming an appropriate amount of Daily Green Boost so they were getting enough cobalt (used by the body to make B12), they were consuming zero irritants (garlic, ginger, spices, tea, etc), and their level of the Intrinsic Factor was obviously good enough (so their genetics were okay in this area), and maybe most importantly, they were not all stressed out by life (stress gobbles up B12, which is why nutrition should be looked at from a Supply & Demand perspective). So while it's possible to have a good B12 status without taking an under-the-tongue B12 tablet, it's not "the rule" even with raw vegans. In fact, I've found that people who eat the Typical Western Diet can have halfway decent B12 levels if they're eating foods fortified with B12, like grain products (if they're not super stressed out). So vegans who eat no fortified foods need to be vigilant to get enough B12 and D, and quite frankly, all the other nutrients (for these reasons). And the above B12 is also sold at Whole Foods. If you're super low in B12 (very high MMA) you may need a B12 injection ASAP. Dr. Joseph Chandy, a GP in Horden, England for more than 30 years, has received numerous accolades, including the Glory of India award, for his ground-breaking work using vitamin B12 for a host of conditions, including chronic fatigue syndrome, Multiple Sclerosis (MS) and depression. Some MS sufferers have even been able to stop using wheelchairs because of his innovative approach. The National Institute for Clinical and Health Care Excellence (NICE) does not recommend B12 to treat fatigue. NICE says there is not enough evidence to support a recommendation to prescribe B12, but admitted some sufferers have reported health benefits.